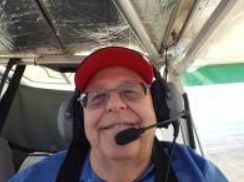 Thanks to the Las Cruces, New Mexico Chapter of the Experimental Aircraft Association’s (EAA’s) Newsletter Editor, Carl Bogardus (Selfie at Left in his plane), we have some good photos of the event they and the War Eagles Air Museum (WEAM) conducted for the general public a few weeks ago at the Dona Ana County International Jet Port. Most of the following photos were taken by the event’s Director, Brett Hahn, an active member of the EAA Chapter 555 AND the FASF. The event was so successfully promoted and orchestrated by these two FASF Sister organizations, that the public turnout broke all-time national records for the Tri-Motor ride experience, with 89 separate flights taking to the air in the vintage transport airplane, lifting aloft some 809 separate passengers for a thrill they’ll not forget! All photos below are thanks to Carl and his fellow EAAers. Remember to click on a photo to view it full size. 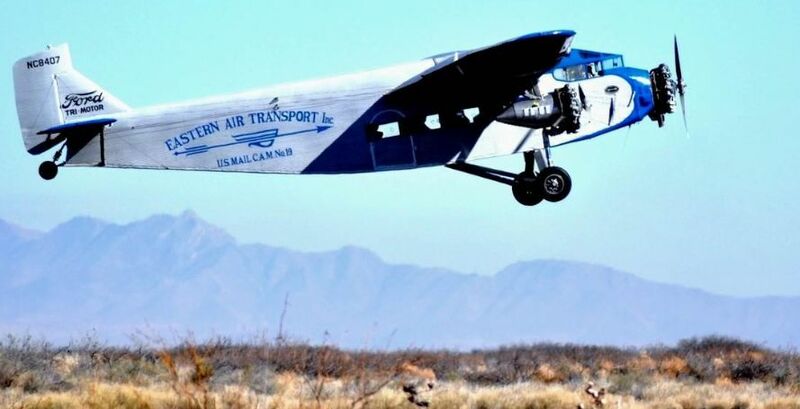 The historic Ford Tri-Motor transport takes off from the Doña Ana County International Jet Port loaded with lucky passengers from New Mexico and Texas. Retired FASF 1st VP and local attorney, Colonel John Orton, is on the Jetport’s Advisory Board. 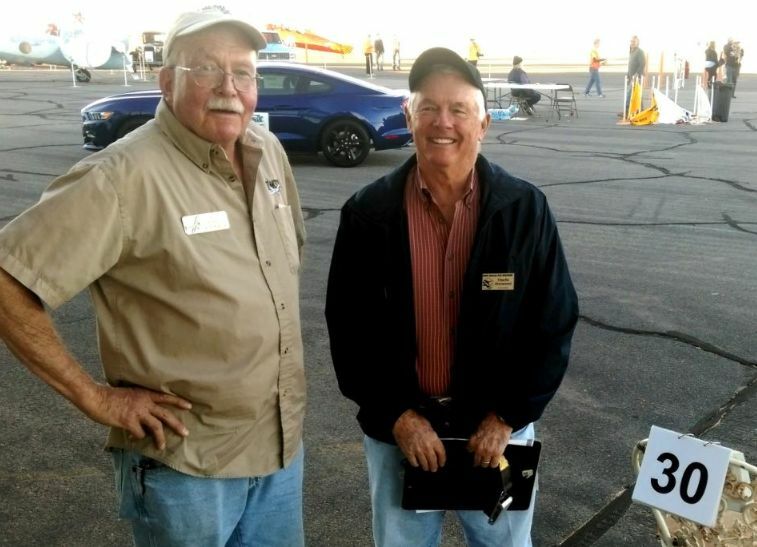 John and other FASF volunteers, such as Dr. Kathleen Martín, Roy Mantei and Bill Madden helped the WEAM team pick up almost 200 new members during the recent “Amigo Airsho” weekend festivities. Here’s a good view of the “front office” of this classic vintage flying machine. 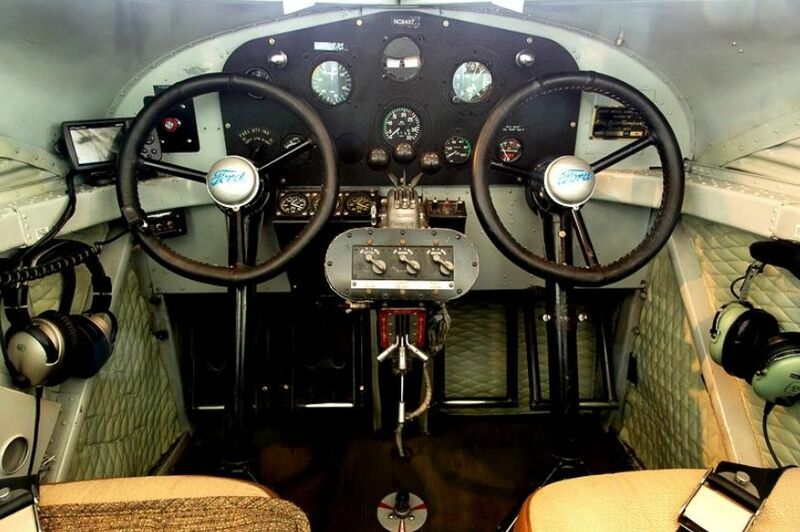 Note the modern aircraft devices that have been added to the classic original “steam gauge” instrument panel seen above. The earphones and GPS screen on the pilot’s left are noticeable improvements for its crew. 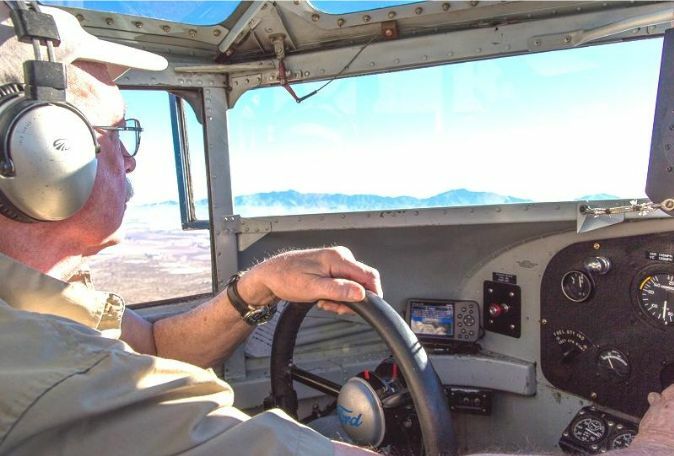 EAA Tri-Motor Captain, Ed Rusch, at the controls. El Paso’s Franklin Mountains are seen ahead. Above, Captain Ed with Safety Briefing Director, FASF Member Charlie Overstreet, a former USAF Jet Fighter Pilot. Charlie actually briefed all the 809 passengers that took the flight at Santa Teresa! Also helping with the crowds was FASF member and also USAF pilot, Virg Hemphill, also of El Paso. Here’s a rare view of the empty cabin, in between fresh passenger loads. 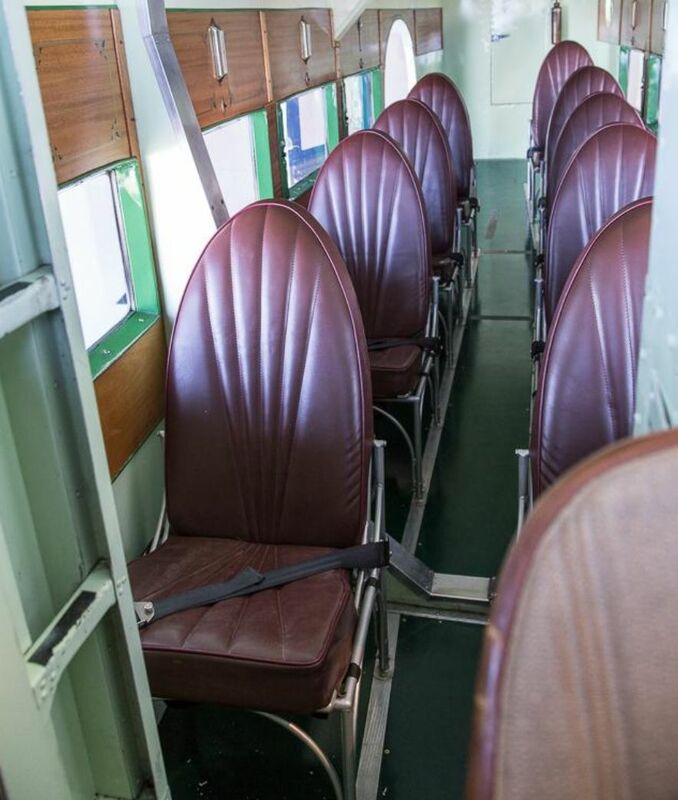 Notice the finely restored interior of this magnificent flying machine. One of our more comfortable and reliable early airliners. Taking and active part in the big event, were “Doppler” Dave Speelman, El Paso and Las Cruces’ KVIA (ABC) TV Station’s Chief Weatherman and his two boys. 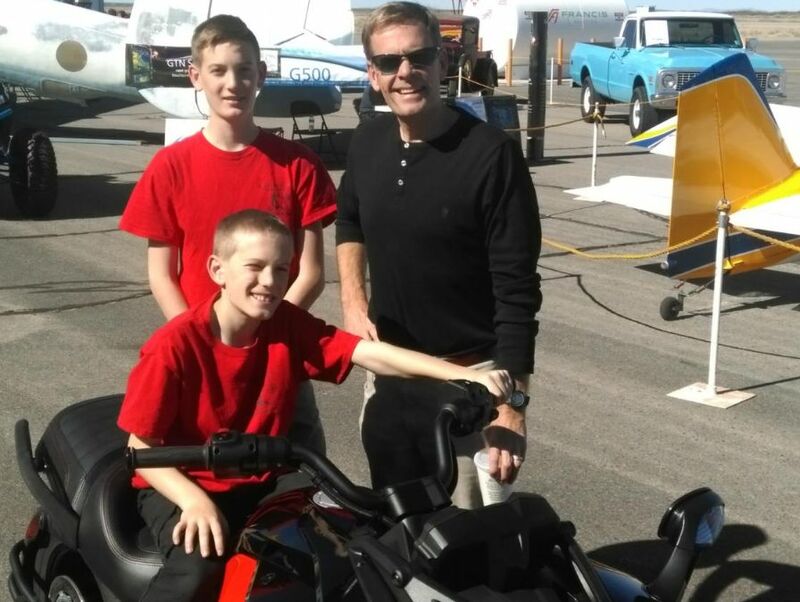 Clearly, Dave and his young men had a fine experience on this historic record-setting aviation celebration. This entire aviation extravaganza could not have been possible without the smooth coordination of the team of WEAM Volunteers, under Bob Dockendorff, Executive Director and George Guerra, WEAM Operations Manager, with the Las Cruces EAA team led by President Wes Baker. Critical to the success of this WEAM effort were a number of key players from the 555 Chapter, whose own Brett Hahn put together the amazingly brilliant public relations effort that generated the all-time record turnout – and who obtained the extraordinarily supportive local business sponsorships. This events’ sponsors and promoters want to remind you not to miss this aviation experience the next time it comes this way. The FASF will keep you posted about when that will be, or you can simply check the EAA’s own website Tri-Motor schedule, should you live in another part of the U.S., as so many of you do. This entry was posted in AVIATION NEWS on February 16, 2015 by FASFRIC.